• For quantitative determination of iron ions Fe3+ and/or Fe2+ and evaluation of drug effects on iron metabolism. • Iron level in blood is a reliable diagnostic indicator of various disease states. Increased levels of iron concentration in blood are associated with blood loss, increased destruction of red blood cells (e.g. hemorrhage) or decreased blood cell survival, acute hepatitis, certain sideroachrestic anemias, ingestion of iron-rich diets, defects in iron storage (e.g. pernicious anemia). Decreased levels of blood iron may result from insufficient iron ingestion from diets, chronic blood loss pathologies, or increased demand on iron storage as during normal pregnancy. Simple, direct and automation-ready procedures for measuring iron concentrations find wide applications in research, drug discovery and environmental monitoring. BioAssay Systems iron assay kit is designed to measure total iron directly in serum without any pretreatment. The improved method utilizes a chromogen that forms a blue colored complex specifically with Fe2+. 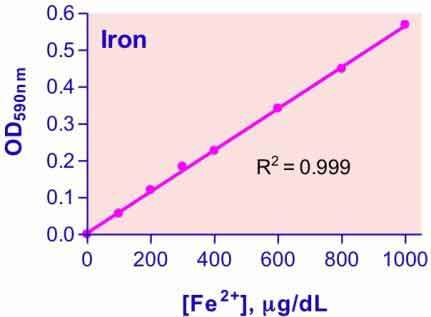 Fe3+ in the sample is reduced to Fe2+, thus allowing the assay for total iron concentration. The intensity of the color, measured at 590nm, is directly proportional to the iron concentration in the sample. 1. I would like to know how serum samples should be prepared for use in the assay. Sera are usually obtained by centrifugation of clotted blood (fresh blood standing for about 30 min at room temperature). Both, fresh serum or frozen serum can be assayed directly (50 µL sample + 200 µL working reagent). 2. Do DTT or IGEPAL/NP-40 in cell lysis buffer will have any influence on the assay? Our data show that up to 4% NP-40 has no effect on the DIFE-250 assay. Up to 20 mM β-mercaptoethanol also had no effect on the DIFE-250. We did not test DTT, but we believe DTT would not interfere with this assay either. 3. Can you use DIFE-250 to measure iron in whole blood? No, whole blood needs to be diluted to a degree that the normal serum iron concentration is below the detection limit of the assay. The assay is not suitable for measuring hemoglobin bound iron. 4. Please let us know the preparation for the liver tissue. Tissue samples should be dried overnight at 106°C and weighed. Samples can then be solubilized in 6N nitric acid by heating at 100°C to release protein-associated iron. The solution is neutralized with NaOH, diluted in deionized water as necessary, and assayed for iron concentration using the DIFE-250 kits.